You must make reservations at least 5 minutes in advance of the time at Tony Roma's - London - South. Tony Roma's is a full service, casual dining family restaurant where you can find premier Ribs and Steaks in locations across the world. With over 40 years of history and 150 family restaurant locations on six continents, Tony Roma’s is one of the most globally recognizable names in the industry. From Miami to Los Angeles, Orlando to Edmonton and Tokyo to Madrid, Tony Roma’s serves its signature Ribs, World Famous Onion Loaf, and other steak, chicken and seafood entrees to thousands of guests every day. Crispy shrimp, spicy cream sauce. Half dozen crispy frenched wings, Fiery Buffalo sauce, bleu cheese coleslaw. Spanish onions, crispy breading, Original BBQ sauce. Sam Adams braised mussels, garlic butter, grilled French bread. Italian cheeses, roasted tomatoes, basil pesto Caesar dressing. Pepperoni, sausage, Italian cheeses, marinara, basil. Romaine blend, bacon, cucumber, Cheddar, BBQ onion, ranch dressing. Romaine, crispy prosciutto, roasted tomatoes, crispy capers, French bread croutons, basil pesto Caesar dressing. Romaine, crispy prosciutto, roasted tomato, crispy capers, French bread croutons, basil pesto Caesar dressing. Romaine blend, roasted tomato, hearts of palm, radishes, crispy chickpeas, crumbled goat cheese, lemon truffle vinaigrette. Kogi BBQ beef, Udon noodles, crisp wontons, mango, avocado, napa cabbage, cilantro, sesame seeds, Kogi sauce. Vanilla, chocolate chip, rocky road ice cream, caramel, chocolate syrup, strawberries, whipped cream. Sweet plum & tarragon BBQ glaze, coleslaw, fries. Red wine & mushroom demi-glace, herb mashed potatoes, seared garlic green beans. Marinated for 48 hours, agave mustard glaze, coleslaw, fries. Small in Size, Big in Flavor. Fiery Buffalo sauce & bleu cheese. Marinated for 48 hours, agave mustard glaze. Grass-fed bison patty, American Cheese, caramelized onions, sweet pickles. Beef short rib, brisket & chuck patty, American cheese, caramelized onions, dill pickles, harissa ketchup. Add Ons: BBQ Shrimp | $6, Baby Back Ribs | $6. Wood grilled, herb mashed potatoes. Choice of: Cabernet demi-glace, Brandy peppercorn sauce, Asiago crust. Wood grilled, bacon chive butter, herb mashed potatoes. Wood grilled, garlic butter, saffron & kale rice, harissa glazed baby zucchini & carrots. Chipotle garlic sauce, tomatoes, linguine, Asiago cheese, basil. Chicken gravy, herb mashed potatoes, seared garlic green beans. Chardonnay butter, roasted tomatoes, chives, herb mashed potatoes, seared garlic green beans. 8oz. ground short rib, brisket, chuck and pork patty, American cheese, caramelized onions, bacon aioli, dill pickles, tomato, lettuce. Served with fries. Crispy prosciutto, feta cheese spread, romaine, roasted tomatoes, basil pesto Caesar dressing. Served with fries. 8oz. ground short rib, brisket & chuck patty, American cheese, lettuce, tomato, onions, dill pickles. Served with fries. Sauza® Hornitos Reposado tequila, Cointreau®, Grand Marnier®. Classic vodka martini with Absolut® vodka, dry vermouth, orange bitters with a lemon twist. Beefeater's® gin, St. Germain® elderflower liqueur, blueberry. RumHaven® Coconut rum, passion fruit, pineapple juice, crushed pineapple. Grey Goose® vodka, Bombay Sapphire® gin, dry vermouth, bleu cheese stuffed olives. Van Gogh® Dutch Chocolate vodka, chocolate mint, white crème de cocoa, cream. Sauza® Chili Cucumber tequila, cranberry juice, Cointreau®. Jameson® Caskmates whiskey, Fever Tree® ginger beer, black cherry purée, orange bitters. Cutty Sark® Prohibition scotch, Peychaud® bitters, Angostura® bitters, sweet vermouth. Served in a chilled 18oz. glass. Can'T commit? Book a flight! Choose any four 5oz. brews on tap for $9. The Cajun Chicken Pasta is amazing! We have been here at this location many times and always find the service friendly, well trained and efficient. Food is served usually fairy soon after ordering and is served in a pleasing manner. Sometimes when the place is busy the noise level is quite loud and we often feel that the music could be turned down a fair bit to allow for easier conversation. We missed the ceaser salad which is no longer available on the menu. The bar has a good selection of beer and my favourite beverage is the Platinum Romarita! My friend and I had a relaxing and leisurely time for our dinner. We were glad we could make reservations and the food prices were reasonable. The groups that were sitting near us were not rowdy either. I might ask next time not to season the steak as it was a little too salty for me. Enjoyed the broccoli. Will certainly have it on my list to come again! Good experience for my husband's 'birthday' dinner . Only issue was with soup of the day ..tomato...very thick almost sauce like. Service cordial, price reasonable. It was what we have come to expect from Tony Roma's. The food was great. The Mediterranean Pasta had a lot of taste but at the same time was a light dish. It had just a touch of spiciness. The server was excellent and had a great sense of humour. The host was also excellent and welcoming and had a great sense of humour as well. It was a very comfortable atmosphere and at no time did we feel rushed. We were first to arrive one afternoon, as we had tickets to see the movie Green Book that evening. It was my wife's birthday so she received her entree free. The waiter, Rich, greeted us with a smile and a joke and started our experience at Tony Romas' with a bang. We definitely will return at some point to repeat the experience and to top the night's enjoyment , the movie was also great. The bar staff didnt provide good service but the dining room staff were exceptional ☺. Highly recommend the restaurant overall, just hope you dont have to wait for your table to be ready cause the bar staff take too long to get you a drink. The atmosphere was great, friendly wait staff, and good food. Yes! I have already recommended Tony Roma's to a friend who was looking for a place to go for dinner. They thought that Tony Roma's had closed and I assured them it hadn't. We love going to Tony Roma‘s for their delicious ribs. We always receive Great service, and of course the ribs are fall off the bone delicious! Increased prices with smaller servings. Food is tasty but costs has increased too much. Don’t even get bread with our meal anymore. We were celebrating 2 birthdays and had a wonderful evening. Great food and good service. The ribs were amazing. We will definitely be back. Celebrated New Year’s Day and birthday with friends and our grandson. Will definitely return for special occasions in the future. Food was fabulous, as was the service. A memorable time was had by all. Our server was very good. The food was delicious and plentiful. Great service. Food delicious. Good value. Comfortable atmosphere. Quick. We were out for our anniversary and service was good. The portions are large so we shared the filets and ribs dinner which was very tasty although the steak was not hot. Great steak dinner. Awesome service! Wednesday night special was indeed special. We'll be back. Will continue to come back here for dinner, service friendly and menu very good. The service was slow, and we weren't given cutlery until we asked for it. My steak wasn't cooked correctly, but they rectified it. We love Tony Rona’s every time we dine there! Great food and service. Servers are friendly, knowledgeable and eager to please. My parents and I dined'for Thanksgiving lunch on Sunday. My father who is hard to please and very restrictivery on terms on where he dines and what he eats could not stop commentin on how enjoyable the food was. He had the shrimp stir fry. My mother also enjoyed the onion loaf app, Chipotle salad which we split and her entree of beef ribs. She wants to return to have the larger portion of the salad as a meal. I encouragedon't my parents to make a point to return and eat at TR once a month. Rich, our waiter/bartender was excellent. Was good as always except to for the fact their soup of the day was chicken-vegetable, however there was no chicken in the soup and they didn’t do anything to correct this. Service from our server was excellent however the two of the three food orders we ordered were not to par. Our burgers were barely warm, felt microwaved vs. grilled (one can tell by the way the cheese had melted on the patty) super salty, spongy and dry. To make matters worse the buns were squished and dry. We sent both burgers back and substituted one of the orders with a steak. 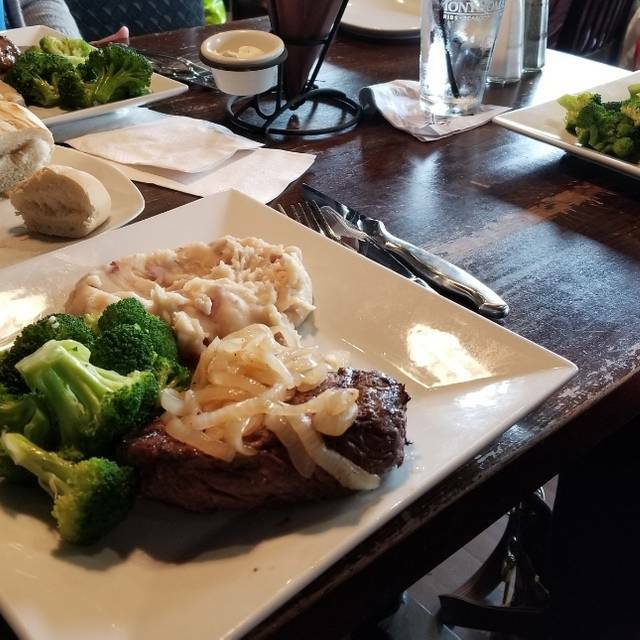 While the steak was well cooked and tasty, we found two hairs on the steak, the accompanying vegetable side, broccoli, was old and discolored yellow. Our server was very understanding, and we were not charged for the steak or the burgers which we did appreciate. However the manager was not accountable to even apologize. We had heard wonderful things and decided to visit but given our experience, we will not return. Please note I have worked in the food industry (policy writing), and understand kitchens and food processing. Great restaurant, have been many times. Would have given perfect stars except there was a lengthy wait this time between the appetizers and main course. I thought the food was only fair. The ribs were good but not many fries. (And they were like McDonald's fries). I can't eat cabbage due to allergies and coleslaw comes with the meal and I wasn't offered a replacement so had to spend another $4 for a small caesar salad. Expensive meal for what you get. Then my partner ordered dessert and the waiter had to come back to apologize saying that they had just run out of that particular dessert. We don't blame the Waiter, of course, but running out of food early on a Saturday evening at an established restaurant was very disappointing. 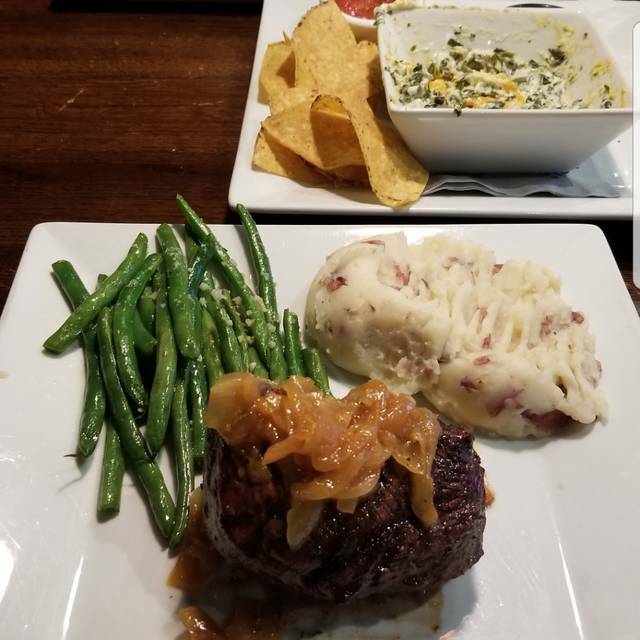 I had dinner there two nights in a row, the service was very fast and efficient, the servers were extremely friendly and knew the menu well, the food was the right temperature and very delicious. The beer was cold. Ordered ribs which, where dry and not very hot. Servers were great. Food always served attractively and hot. Love the cocktails and a good beer selection for the hubby. Staff always efficient and friendly. Service and food were both excellent. However, we could have used a bit more time between our appetizer and our entree. I was still in the process of eating my salad whe n the enree was served and had now place to put my bowl on the table so I could finish eating properly. All three of us had the back ribs with various sides. Hard to beat Tony Romas' ribs!! Everything was delicious as usual! My husband was disappointed with his meal. He said nothing was hot at all. He thought he got ripped off on his half rack of ribs. My meal was fine, potato could have been cooked more. nd my leftover ribs home. When I opened them to eat for lunch today, I found that the potato was not included, which was frustrating. The server was friendly and customer service oriented, she provided us with their food and beverage specials for the day. Very attentive. The special was well prepared and good quality.i would definitely go back. The London North location was far superior in every aspect, especially the food. I ordered the half rib dinner, as had many times previously at the North location, but it came barely warm and the ribs were not "fall off the bone" at all. Won't go back, and had been a raving fan up until then. Spent Canada Day enjoying some activities in London, Ontario. Wound up with a delicious dinner here. Great food and a good time had by all. Our waitress was friendly and seeing to our needs within a very reasonable time. Not our first time here and not our last either.